Eulogistical Services program for Mother Margaret Black Jones (1889-1976), the sister of Pilgrim Black (1905-2002) and the aunt of Patricia Ann Black (1956- ). The services were held on February 23, 1980, at the Hickory Avenue Church of God, located at 503 Hickory Avenue in Sanford, Florida. Reverend Percell Sanders presided over the service. Margaret Black was born on June 23, 1893, in Sanford to Harry Black (d. 1911) and Maggie Benjamin Black (ca.1870-ca.1934). She had four brothers and two sisters: Pilgrim Black, Leatha Black Walker (1889-1976), and Harriett Black Lawson. Margaret married James Jones and had five children: Reverend Charles Black, James W. Jones, Pauline Jones Parrish, Ella Jones Randall, and Christine Jones Childs. Margaret joined the Hickory Avenue Church of God in 1952 and served as a member of the Mothers' Board and Ladies Auxiliary. On February 18, 1980, Jones passed away in Sanford. Her funeral services included speeches and performances by the Gospel Choir of the Hickory Avenue Church of God, Bishop Leon Devaux, Bishop Roosevelt Hestle, Mother Odell Turner, Aletha Hardy, Deacon Tommie Hayes, Sister Dorothy Miller, Sister Fannie Bookman, the Angelic Trio, Bob Brown and his staff, and Reverend Percell Sanders. Original program, 1980: Hickory Avenue Church of God, Sanford, Florida: Private Collection of Patricia Ann Black. Digital reproduction of original program, 1980: Hickory Avenue Church of God, Sanford, Florida. Originally created by the Hickory Avenue Church of God and owned by Pilgrim Black. Ratzlaff, Nina. The History of the Church of God in Florida. Lake Wales, FL: Florida State Executive Committee, 1977. SURVIVORS: Sons: Reverend Charles Black, of Bridgeton, New Jersey, Mr. James W. Jones, New York City; three daughters, Mrs. Pauline Parrish. Philadelphia, Penn., Mrs. Ella Randall & Mrs. Christine Childs, New York City; two devoteed granddaughters; Gwendolyn and Gloria; one sister, Mrs. Harriet Lawson; one brother; Mr. Pilgrim Black of Sanford, Florida; one brother-in-law, Mr. Charles Lawson; two sisters-in-law; Mrs. Lula Black and Mrs. Lugenia Black; eight other devoted grandchildren; ten great-grandchildren; one great-great grandchild and a host of sorrowing relatives and friends. Just on your face and eye. If you haven't shoes on your feet. Your soul you are sure to lose. And move to the city tonight. WESLEY BROTHERS PRINTERS - DAYTONA BEACH, FLA.
Hickory Avenue Church of God. 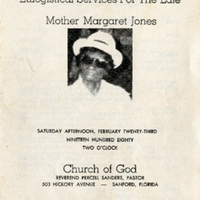 “Eulogistical Services For the Late Mother Margaret Jones.” RICHES of Central Florida accessed April 20, 2019, https://richesmi.cah.ucf.edu/omeka/items/show/2660.